This turned out to be a more difficult film to review than I had initially expected. In fact, I had expected this film to be something of a breeze. A big part of that is because this doesn’t seem like a difficult film to watch to begin with. In fact, after having seen it, I’d contend that it’s one of the easiest films to watch of the year. You won’t have to spend too much of your brain cells trying to make sense of this one, though that is not the same as saying that it is a mindless film. I have to disclose, perhaps in the interest of objectivity (not that we deal very much with that here, natch), that the film is directed by Lee Seung-moo (listed elsewhere as Sngmoo Lee), who taught me Advanced Production Workshop for my final semester in Korea. In fact, he was the supervising lecturer for my graduate project. Another lecturer of mine, Lee Jooick, is also the producer of this film. To complete the picture, Jang Dong-gun was once enrolled at my university as well, though this was generations ago, and he did not actually complete his studies there. Proof, to the parents amongst you, that you don’t need a university degree to have a successful life. You do, however, need to be very good-looking. And tall. With perfect white teeth. And nice hair. So pick your mating partners carefully. Jang plays the role of Yang, a warrior who completed the ascent to become the best swordsman in the world. How do we know this? Because the script comes on the screen to tell us so, that’s why. “Ah, so it’s THAT kind of movie,” I thought to myself, adapting my mentality a little bit. Alas, this ‘Zombieland’ approach wasn’t carried through as Yang comes across a young baby, a part of the clan he had just fought. Having destroyed every member of the baby’s clan, here is the chance for him to rid of the enemy once and for all, and to truly fulfill the oath of total extermination he took up prior. Of course, with the baby being incredibly cute (and Jang Dong-gun himself probably thinking of his own newborn baby), he decides not to do the deed. Packing his meagre belongings, the world’s greatest runs of to the Wild West, looking for refuge with an old friend of his. What he found was not his friend, but the meandering members of what appears to be a lost travelling circus (lost in the sense of not knowing what they’re doing, rather than being geographically ignorant. Although that could be a factor, too). 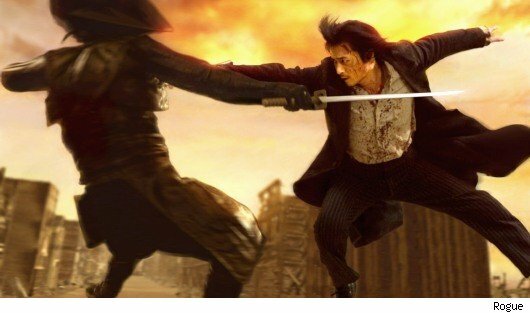 Asians + Hollywood-ish = samurai swords. Which leads to the beginning of the first thing that I want to say about this film: it is not entirely serious. In fact, it doesn’t quite have the undertones I have expected. The promotion and marketing of this film seems to have centred on creating a somewhat serious and mean film, one that is tough, aggressive, and has plenty of gore to spread around with reckless abandon. There’s all of these things too, but it missed out on one thing: fun. The ‘fun’ factor of the promotion wasn’t very obvious, and I’d venture a guess that my lecturer, while trying to make ‘The Warrior’s Way’, wasn’t trying to make a film that took itself too seriously. Think of the playful undertones to ‘The Good, The Bad and The Weird’, as well as the ‘Kill Bill’ movies. Both were relatively violent, with plenty of gore; both were also a fair bit of fun to watch. If, like me, you might have thought of ‘Mongol’ (very similar poster) or ‘Ninja Assassin’ (very similar budget), then you’d have thought wrong. Yes, it has used green screens extensively. Yes, the action was not quite so realistic. But how seriously are you supposed to take a movie in which one of the main antagonists is called Saddest Flute? I suspect that with a clearer and cleverer(!) bit of marketing, it would have worked wonders, and made more than the 10% of its estimated budget thus far; as it stands, you’ll be lucky to catch it, given how quickly it is sinking almost without a trace from both local and international screens. 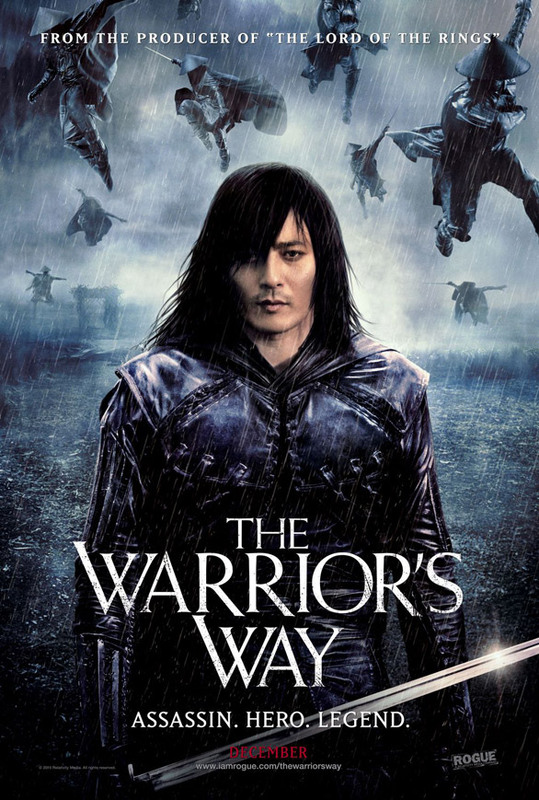 That would be a pity, because as I have mentioned before, ‘The Warrior’s Way’ is bright and lovely little film that is worth watching if you’re looking for some mindless action and drama. This doesn’t mean that the script or the story is loose, for almost everything you see in the film, from the Ferris wheel to the sakuras floating in the wind, serve a narrative purpose one way or another. That’s quite a pleasant little surprise, that nothing really falls through the plot holes, because there’s not much holes to begin with. You could argue that the believability of certain things are stretched, but you could say the same for loads and loads of other movies. That has been the biggest surprise for me, to be honest. The CGI-laced action was well-choreographed, and in terms of quality, falls smack bang in the middle of what a $42 million film looks like. The Psycho remake was very feminist. …and did not shut my eye to sleep. Strange, that. No matter how interesting a film may (or may not) be, I tend to find some shut eye time when I do get exhausted. But not here. A big part of that may be the actors, who all did their roles well enough. I do wish that Jang would speak up a bit, but perhaps that’s to hide his not-so-perfect English. Then again, it plays well into the lonesome stranger idea, so that’s not a worry. Speaking of which, another interesting aspect of the film is the multi-cultural and -generational influence the film seemed to be channeling. You’ll find something from the old Westerns to the latest offerings; I’ll leave this to you to discover. The rest of the cast seemed to do OK enough, some of them making it seem so effortless they might as well have been sleepwalking through their roles. I sat down with my little brother and sister as they popped through ‘Toy Story 3’ (again) the other day, and it hit me: Bosworth’s Lynne is a real-life adaptation of Jessie. The collective might of Jang, Rush, Bosworth and Huston couldn’t beat Analin Rudd, though; the one character that got the most laughter, smile…heck, the most enthusiastic of responses from the audience was the baby. Anyways, that’s enough for now. Let me stop here. 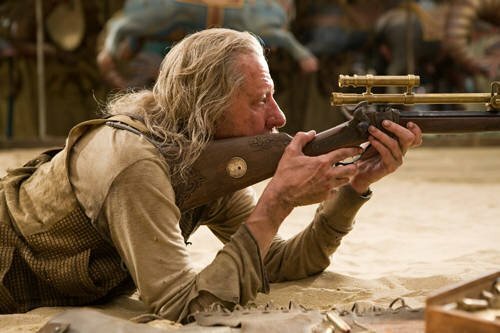 A lot more fun than you might think, aided with decent effects, a tight script and editing, plenty of violence, gore and slow-motion style that Zach Snyder should be castigated somewhat for helping to inspire. There’s enough of those ‘fuyoh!’ moments that will keep many of its target audience happy (ninjas in the Wild West!). And…very nice music. I waited for the credits to roll, and lo and behold, it was Javier Navarrette, the genius behind ‘Pan’s Labyrinth’. The opening of main score for that film always reminds me of ‘The Last Waltz’ from the soundtrack of ‘Oldboy’, a quintessential film not just of Korea, but of the archive world cinema. Full circle, it seems like. I guess that’s what they call karma. Fikri likes the undertones of the Jang’s battle costumes near the end. East meets West, very cool.